Alright, time for the promised pancakes! 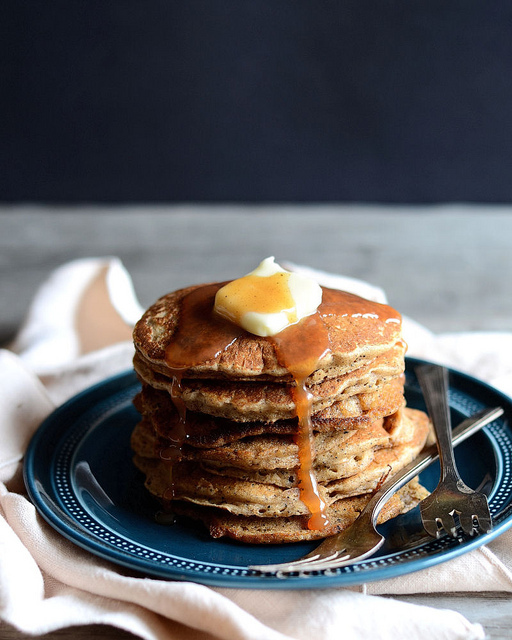 When Emma pinned these Dirty Chai Pancakes the other day, I knew I needed to make them. And so I did. Reuben loved them. “These are really good pancakes,” he told me with his mouth full. Lovely Chai spices are mixed in with the dry ingredients. 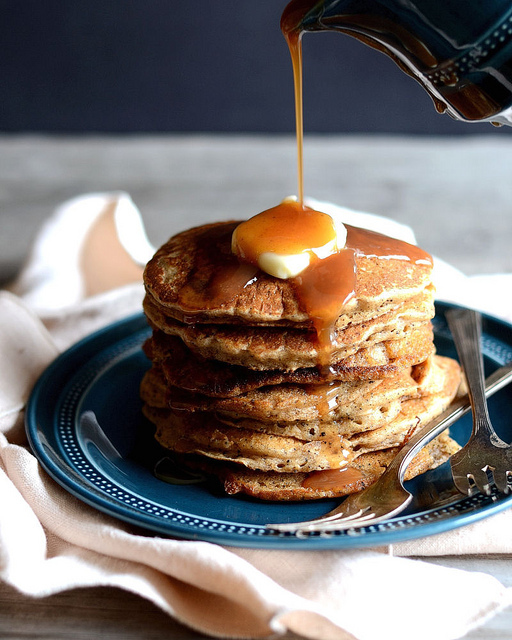 Fresh-ground espresso makes these “dirty” pancakes. You should whip these up. Today. For breakfast, lunch or supper! They’re good any time. The original recipe called for spelt flour, but I subbed whole wheat and AP flour with great success. It also called for non-dairy milk, but I just used regular whole. I didn’t have any maple syrup on hand, so I just mixed up a spiced caramel sauce. You could also mix a few spices into warmed maple syrup if you prefer. 1) Place the sugar in a medium heavy saucepan over medium heat. Stir vigorously with awooden spoon until the sugar melts. This will take a few minutes. 2) Once the sugar has all melted start adding the butter one piece at a time. Whisk until the butter is completely melted. Wait about 3 seconds and then add the cream slowly. Whisk as you add until the mixture is smooth and creamy. Remove from heat. 3) Add the salt and spices and whisk again a couple times just to incorporate. 1) Combine the milk and vinegar in a liquid measuring cup. Stir lightly and set aside to curdle for at least 5 minutes. 2) In a large bowl, whisk together the flours, baking powder, baking soda, salt, ground coffee, cinnamon, ground ginger, cardamom, nutmeg and cloves. Add the curdled milk, maple syrup, melted butter and vanilla extract. Stir gently to combine, taking care not to over mix. 3) Heat a large cast iron or nonstick skillet over medium heat. Brush the pan with melted butter. Drop 1/3 cup measures of the pancake batter into the pan. Allow the first side to cook for 1 to 1-½ minutes, or until bubbles pop on the surface and the edges appear dry and lightly browned. Flip the pancakes over and cook for another minute. Remove pancakes and keep warm. Repeat with remaining batter. 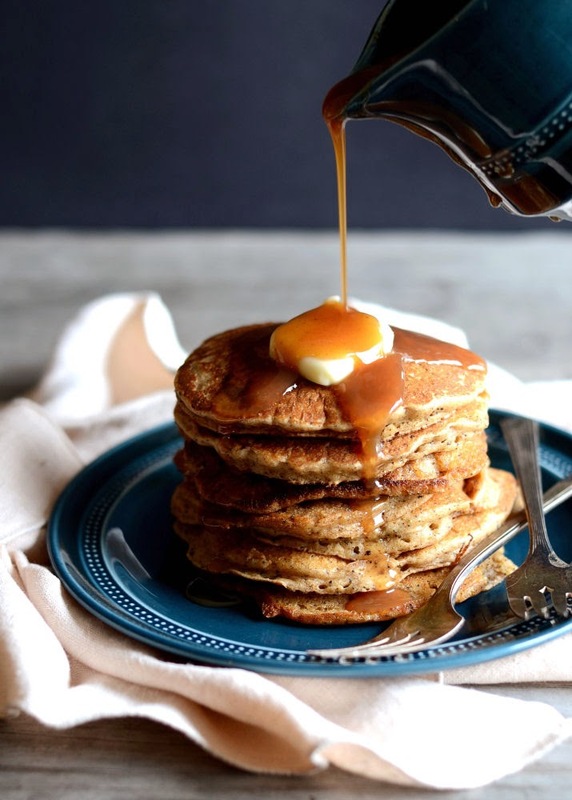 4) Serve pancakes with lots of butter, spiced caramel sauce or maple syrup. Yum! Oh my goodness, this sounds so good. I was going to make steaks tonight…. but I might need these instead. They look that good. Oooooh, I should try them as waffles! OOF! I'm so inspired by these pancakes! 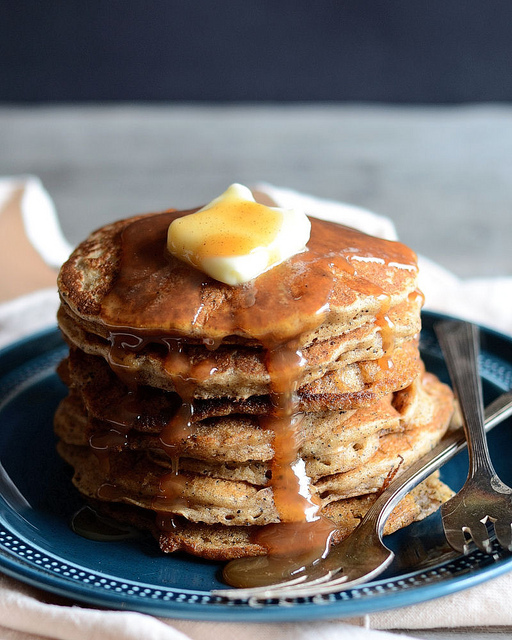 I absolutely love Chai everything and can you believe I've never made homemade caramel sauce? I'm dying to whip these up this weekend!